The Pittsburgh Penguins currently occupy the final wild card spot in the Eastern Conference with just a week to go until the trade deadline. Injuries to Evgeni Malkin, Nick Bonino, Eric Fehr, and Beau Bennett have robbed the team of depth and will provide a big boost to a team that's been back and forth between 3rd in the Metro and 9th in the East in their absence. The Penguins have undoubtedly been a much improved team under Mike Sullivan, even if the magnitude of that improvement has yet to be reflected in the standings, but the decision to be buyers at the trade deadline isn't one to be taken lightly. There needs to be a reason behind the moves, a purpose for making them, and when looking at the Penguins' situation it's abundantly clear that they need to stand pat at the deadline. That's not to argue that the Pens don't have weaknesses that they can improve. The defense could certainly use a reinforcement in the top 4, especially given the inordinately large importance Kris Letang has for the unit. A top 6 LW could help reinforce the forward depth at the top, while a solid bottom 6 player could help reinforce the group from the bottom. 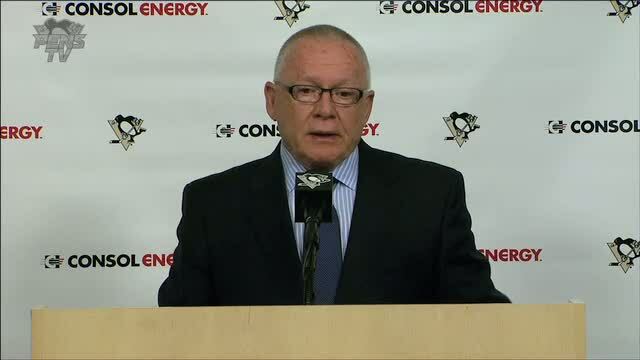 There are potential deals to be made, if GM Jim Rutherford decides to go looking. He clearly has reasons to look to add players; but is there a purpose to making the moves? With any move that Rutherford makes at the trade deadline, or in general for that matter, he needs to be able to answer what that transaction accomplishes. He had a spotty performance at the last deadline. The Daniel Winnik trade fortified a bottom 6 that was in desperate need of talent, but it came at a very high price, relatively speaking. Swapping Ian Cole for Robert Bortuzzo was hoping that his team's bottom pairing defender who didn't have a future with the team could be improved by another team's; Cole had success after the deadline last season but has been largely disappointing this season with higher expectations. And the Ben Lovejoy trade had such a narrow reasoning, adding consistency a the expense of talent for that one playoff run, that everyone involved should have immediately known to walk away. But the question of what the transactions accomplish needs to be answered on a much larger scale. Last season, Rutherford made several largely marginal trades for a relatively high cost in an attempt to take a team that was in the middle of a logjam near the top of the conference and put them over the top. He had reasons to make the moves, but the purpose was lacking - the moves weren't enough to put the Pens over the top even if they had stayed healthy, and they certainly didn't justify their cost. Ray Shero is routinely lambasted by Pens fans for his asset management at the trade deadline, and while he arguably didn't have as much reason to make his deals as Rutherford did given the strength of his teams, he certainly had a much better purpose. Shero had teams that were at the top of the conference that if they weren't the favorite to advance to the Stanley Cup finals out of the East, they were certainly on a short list. His execution left much to be desired, but there's no doubt about the purpose behind the moves. And viewing the 2016 trade deadline through that lens, what purpose do the moves serve? Are they being made to solidify the Penguins as a playoff team? Are they being made to improve the team's chances of moving on one more round? Whether they're in the Metro or Atlantic side of the Eastern Conference bracket, the road to the Stanley Cup is likely to travel through Washington. That's not to imply that the Capitals can't be beaten, or that they'll progress far enough to meet the Pens based on where Pittsburgh gets seeded, but they're clearly the best team in the East this season. Are deadline deals going to push the Penguins past the Capitals in terms of team strength? No, they're not. Will they pull the teams even? That's highly unlikely as well. And if the Penguins are going to have an outside shot of beating the Washington Capitals in a playoff series regardless of the moves they make, they shouldn't look to waste the assets, especially after years of mismanaging the team's future to this point. That's not to say they should turn down a deal that improves the team in future season, or improves the team depth for a late round pick, but the major deals should be left for others. The franchise and fanbase aren't going to be satisfied with a push that gets them into the playoffs before bowing out in the 1st round. They aren't going to be satisfied watching draft picks and/or prospects shipped out of Pittsburgh to watch the team bow out in the conference semifinals. The barren state of the farm system dictates that any move needs to put Pittsburgh over the top. The problem with a short-timer like Rutherford who is used to the low expectations of Carolina is that he might read the current situation as a time to buy. For the sake of the organization, both in the present and in the future, Jim Rutherford needs to be prudent over the next week and stand pat at the deadline. Not saying Pens shouldn't stand pat, but your rationale for determining "purposes" and "reasons" - especially in contrasting J.R. and Shero - falls flat, as these words are synonyms.